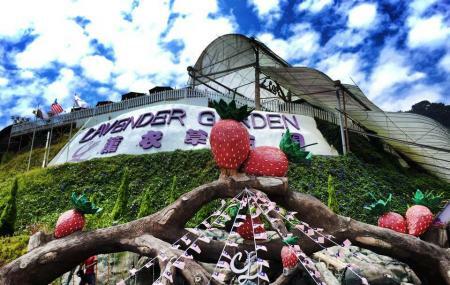 One of the most alluring lavender gardens in Malaysia, the Cameron Laender Garden assures you some of the most beautiful views of your lifetime. You can see blooming lavender flowers strewn everywhere offering you picture perfect scenes. At the gift shop here, you can purchase fragrant lavender products as well as gifts. There is also a café here where you can have something unique: Lavender inspired cuisine. There is a dedicated strawberry picking farm inside for you to collect succulent strawberries. How popular is Cameron Lavender Garden? People normally club together Gunung Brinchang and Time Tunnel Museum while planning their visit to Cameron Lavender Garden. Cooling. There is a love lock where u can hang yours! There is a purple castle where u can take pictures at. It is a beautiful sight as they not only have lavenders but other flowers such as daisies, morning glories, and many more. U can also buy either lavender or strawberry ice cream. A must do! Don't pass this by. This is a beautiful garden with lots of places to do photo ops with the family. Having said that, there are only three varieties of lavender. But one doesn't really mind it given that the entire garden has supremely beautiful flowers. Beautiful place and well maintained. Only problem is the parking which is limited. So when you go during holidays make sure to go as early as possible so that you get a parking or you will have to park by the road side and walk a distance.